A black and white photograph of Burns Presbyterian Church in Ashburn. View is of the front of the church. Burns Presbyterian Church is located at 765 Myrtle Road West in Ashburn. It was built in 1857 on the south side of the 9th Concession of Whitby Township west of Ashburn Road. It stood nearly opposite the school. The church was destroyed by fire on February 12, 1967 and was replaced by a new church building the following year. 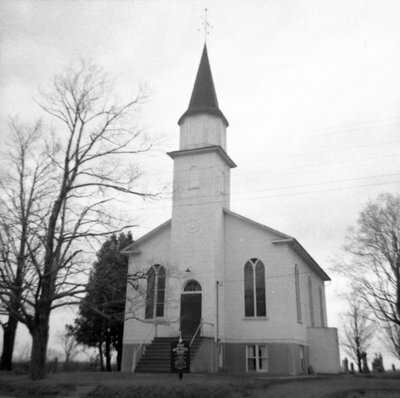 Burns Presbyterian Church, Ashburn, April 11, 1966, Brian Winter. Whitby Archives A2013_004_282.